She's Fantastic: Marvel Legends Infinite Series - SPIDER-GIRL! She's extremely posable, but it's always a struggle trying to keep the lines of her costume lined up properly. That pesky thigh cut will keep her stripes askew no matter what you do. I hardly ever use flight stands, but I broke out one for this review... forgive my amateur skills with flight poses. Here are a few pics from the comics. 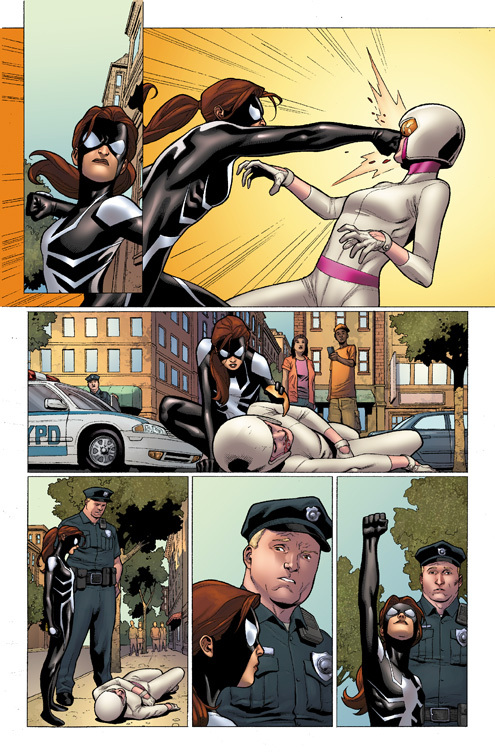 Seriously, pick up the Spider-Girl: Family Values trade which collects her 8-issue solo series. It's a really fun read. If you liked the Stephanie Brown Batgirl series, you will definitely enjoy this. 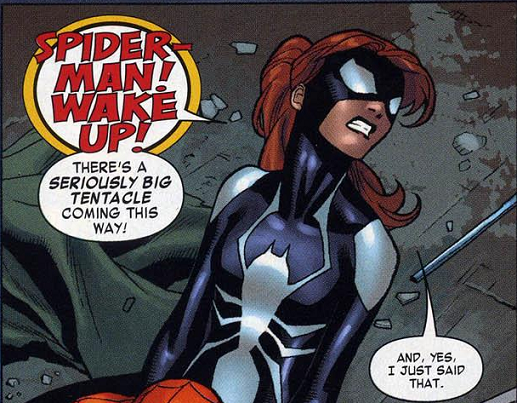 One thing Spider-Girl seems to be missing are the spiders on the back of her hands. 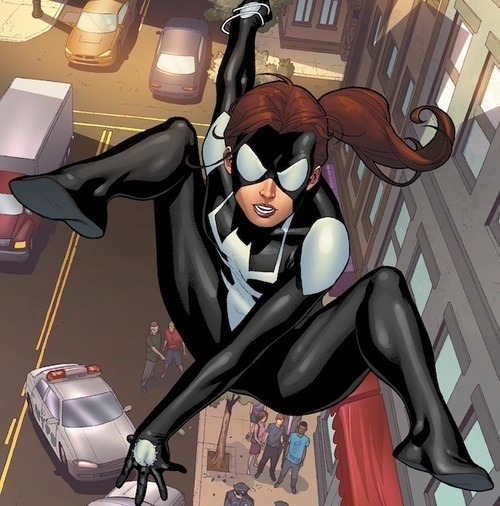 Anya doesn't have typical spider-person web-slinging abilities, but rather these small spiders on tethers that work kind of like grappling hooks. She swings around in a fashion similar to Bionic Commando (if the reference means anything to you). Here she is with her fellow "Skyline Sirens" lady, Black Cat. And here she is with Marvel Select's Arachne from 2009. Let's add 2013's Marvel Legends Red She-Hulk for good measure. She looks great! I will definitely be looking out for her. I'm obsessed with her. I'm keeping my eyes peeled for a second one because some of the white stripes on mine are uneven (especially on her hips and the sides of her chest). I've seen a few of her in Targets already so I don't think she'll be too hard to find. I didn't know she had an all new mold. The one we first saw on Jubilee I gather? Both the Skyline Sirens are fantastic figures! Love the outfit & headsculpt. Her buck is fantastic. I keep forgetting about Jubilee.. i hope that wave will make it out eventually. It's not really a good sign that none of the figures appeared at Toy Fair. I honestly wasn't a big fan of the old buck being used for Rogue, Phoenix, and Songbird. So, if they were delayed for tweaking and upgrades to a new buck, I would be totally down with that. I tend to think most of the figure go toward new headsculpts, which are complete and I assume could be transferred to new buck without much effort.